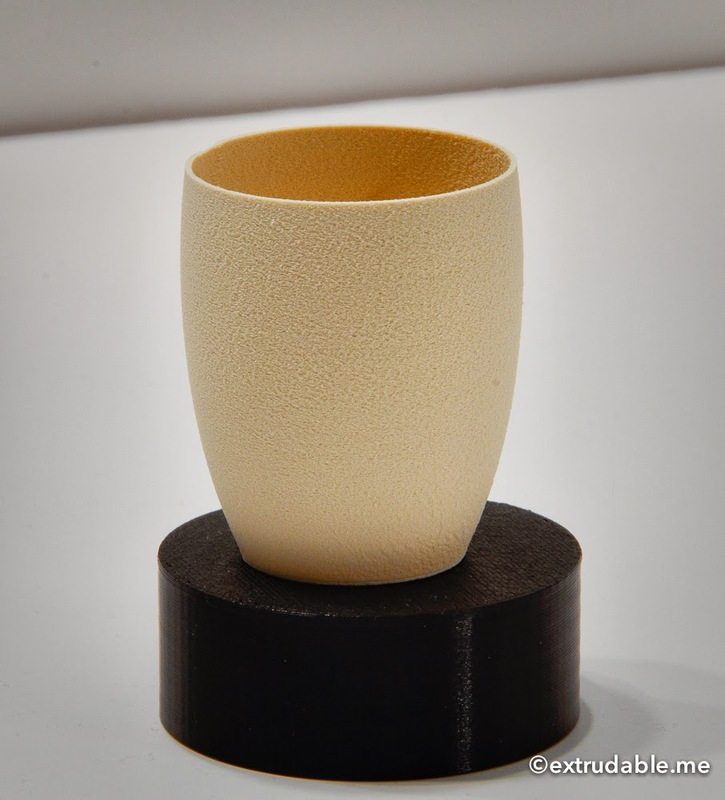 3D printer improvements: Review: what materials can be 3D printed? Review: what materials can be 3D printed? What materials to 3D-print ? Every now and then I am being asked about it, so here is a post on the many materials that can be 3D-printed at home. It is not complete and will expand with time. It is no buyer's guide either, nor a technical document. Read it as a short generic survey of usable materials. There is also a post dedicated to materials most suited to artistic goals. As for me and many others, I print mostly with PLA filament (see below). Even though I have a set of other materials (wood, rubber, Nylon and so on), I did not test all the following myself, mostly because each material requires its set of specific time-consuming trials and errors to achieve good quality. Mastering all of them would take me months, if not years! Once again, the open source / open hardware community rocks, because a lot of enthusiasts explore a lot of subjects... So, for once, I borrowed most of the pictures in this post: check the credits and links for further info. There are probably a few mistakes, so let me know! One final word of introduction: I willingly omitted materials and techniques incompatible with hobbyists (for now), such as concrete or metallic powders as offered by some high end laser-based professional printers. Polylactic acid is the most common filament used by hobbyists, the other one being ABS. PLA is a class of environment-friendly plastic which is entirely made out of natural products, hence the organic plastic or bioplastic name. Really, it is a mix of corn starch and sugar cane derivatives that meets food-grade and biodegradability standards and even made its way as surgical suturing. How strong and biodegradable is PLA in reality ? Actually, I printed and used the above PLA adaptor for a swimming for more than half a year, and failed to notice any degradation. PLA also resists sunlight (UV) better than ABS plastic... This is a bit puzzling to me as a biodegradable material, though it is very convenient in practice. So this plastic is both robust and greener than almost anything I see around me, except for chocolate, clay, and wood may be (see further). 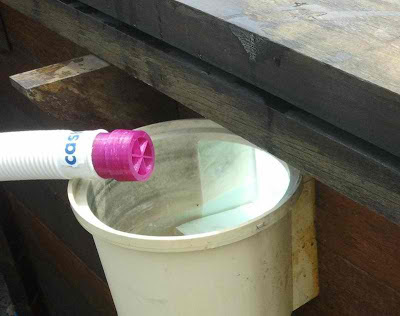 A cool, versatile, easy, and useful plastic that needs no oil at all. Note: some people use home-printed PLA for drinking cups. Still, except for the natural transparent flavor, do not forget that the coloring pigments may not be as harmless as the PLA itself, and they are mostly never documented. Regular PLA usually print very nicely and finely when extruded at around 220°. It releases no fumes and barely smells like pancakes Because it is green as opposed to the other oil-based plastics, you can print inside your house without any danger, not even complaints from your family. 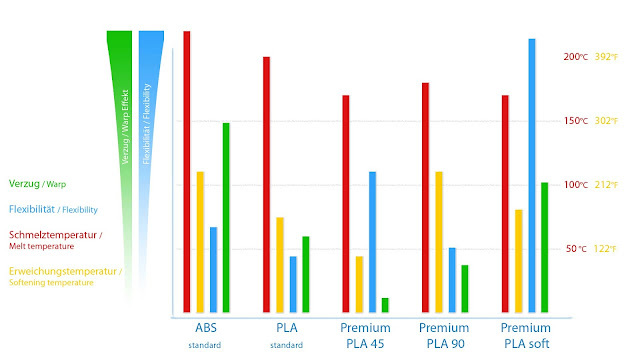 Now, regular PLA becomes soft as soon as 50° and is structurally limited for some mechanical systems, though tough gears are commonly made with a very high success rate. In reality, the main drawback is that it cannot stand being too close to a heat source. Some PLA flavors are less common but can be very useful for specific requirements, such as lower or higher softening temperatures point (from 45 to 100°) or with a softer or elastic texture (see these printed tank tracks for example -- which is still no rubber though). 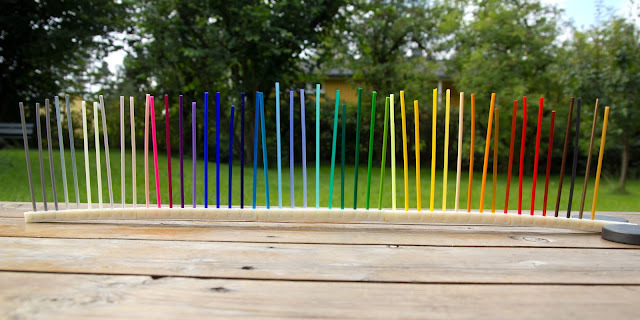 So-called "Natural PLA" is transparent, but you will have tons of colors to chose from, including a fully transparent version, some that embeds shiny particles and some with lower melting temperatures. This makes PLA very well suited to artists and toy makers. Some even made the best of them by switching filament, or even blending different colors at the same time (RichRap rules again). Of course it require a trickier printer setup. PLA comes in different temperatures thresholds and flexibility. The two are not necessarily correlated as shown below. One nice thing with PLA is that it stays flatter and sticks better than other plastics to the printer bed when it cools down, so your print stays flat and attached to the printer bed. Using a heated bed helps, while it is almost compulsory with ABS for example. 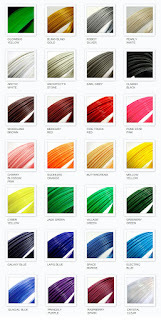 Flashgamer nice post on printing with many colors (excellent picture!) - The related suppliers are listed. Finishing a PLA object is definitely more difficult than with ABS plastic for example, where acetone almost does it all ;) Speaking of petroleum derivatives, almost none will impact the organic PLA. Now, it is easy to re-heat PLA with a hot air gun, a gas torch or a lighter, to repair, bend or weld parts together. You can still glue parts with the proper chemicals, and some "good" ones are being found nowadays (see the discussion here, or there e.g.). As for me, I tend to rely on cyanoacrylate or more flexible glues when appropriate, but PVC primer/cleaner, dichloromethane or tetrahydrofuran﻿ may be much better candidates (take care about their toxicity though). The latter is cheap when bought as the cleaning agent for the liner of swimming pools before PVC glue is applied (25€ / liter -- but what on earth will you do with one whole liter?!). PLA may be painted also with acrylic paints, but I still have to find an easy and clear test. In order to mask the layer artifacts some use lots of layers, while some other like me recommend a thick primer or automotive spray filler. Some other recommend careful sanding/polishing first (sometimes with cold water to keep the PLA from gumming). Check Daniel Schneider's wiki post about how to finish printed objects (where the post itself is unfinished, ha!). And also Bertho, with different chemicals (here and there). PLA really is the preferred choice for many, because of its numerous and interesting properties, among which are its solidity, colors and organic nature. Just have a look around you and you will almost necessary find ABS: from your computer mouse to the waste pipes of your house, Lego bricks and even acid containers. ABS is definitely the other material of choice when it comes to 3D printing. What makes it so common in the industry is that it can also be molded in addition to being extruded. It is cheaper than PLA and it also can be recycled, but contrary to PLA, it is made out of oil (the production of 1 Kg of ABS requires about 2 Kg of oil, see the wikipedia). Obviously it also comes in many colors, including transparent as PLA (but can be made even with some acetone finish, see below). When cold, ABS is a bit more flexible than regular PLA, and this may be better for some usage as it will stretch before it breaks (thin PLA is somehow elastic but it breaks easily, while thick PLA objects are very sturdy and rigid). 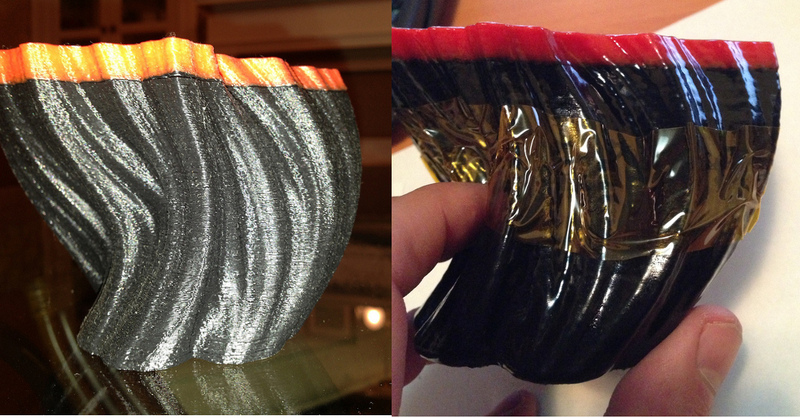 ABS filaments seems more homogeneous than the numerous PLA variants (elasticity, transparency, low/hi temperatures). Finally, ABS fails to sunlight: UV radiation makes it brittle in the short/mid term, so it should be used very carefully for outside. More pros and cons of ABS vs. PLA can be found on this page at protoparadigm (also a buyers's guide), and on Pixilagency. This video shows well how PLA compares with ABS in the real world. Printing is done at a somehow higher temperature than PLA (~245°), at which it flows nicely due to a lower viscosity (easier than PLA that solidify quickly and may be trickier in the nose). Make sure neither you nor your pets breathe the toxic fumes that it provokes (though it may not be as harmful as I fear). Now, ABS curls a lot when it cools down, which pops the part off the bed before the end of the print. 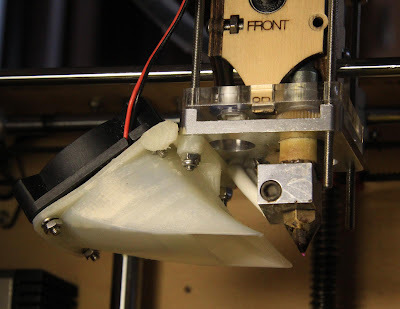 A heated bed is then considered a must by many to keep the first layer warm while printing. Finished ABS objects can be glued or soften with petroleum solvents such as acetone, that also produces a polished look. Contrary to the more recent PLA plastic, there are a lot of options to post-process or to paint ABS objects. Post-processing of ABS with an acetone vapor bath (Josh Smith's is not kidding with his Smoothing Station II). It will probably be easier to follow Neil Underwood setup (here on reprap post). For reference you may also check here for a long and technical comparison of oil-based plastics. This is an uncommon but very interesting filament that dissovles in water! It is mainly used as a temporary support structure in dual head printers, to solve overhang issues. One head prints the PVA structure, and the other head prints standard plastic on top of it. Once the object is done, it is drown in water and the PVA magically goes away, freeing the expected mechanical components or overhangs without a need for annoying manual post processing. PVA thus makes possible some otherwise impossible prints. But it has major drawbacks... Not only is it both expensive, but it also loves so much water that it soon deteriorates due to the ambient air moisture if not properly sealed or dried before use. Nylon is another oil-based plastic, which is cheap, flexible and extremely robust. For now, there are no choice for color yet, unless you color them yourself with fabric dye. Nylon has its own set of interesting properties, even compared to ABS, such as a much higher flexibility and very high strength, which is well suited to gears or phone cases for example. This is my second choice after PLA, as I do not like much ABS which is in between but warps a lot. No need to use a fan with Nylon, but I recommend to use cellulose-based printing beds (such as MDF or hard cardboard). My hot end with Owen's latest fanduct replacement, suitably printed in Taulman 618 Nylon copolymer. PLA would fail due to the close hot end, and even more when printing ABS with a 100°+ hot bed! Specifically made Nylon filament is now available from resellers, with the additional property that you know what you get and that it can be extruded at temperatures which are safer for the hot end materials themselves like the PEEK insulator or PTFE joints (about . Now, you can also print with weed whacker, also known as trimming line: it is less than half the price of PLA or ABS filament, but it sometimes requires higher temperatures (245°), and it may provokes toxic fumes, so be careful. Some people recommend drying the filament to the maximum extent before use and to keep it in a sealed bag afterwards because it also loves water, though I think otherwise (see how I print Nylon and other plastics reliably). Indeed, printing with a non-dry filament results in water evaporating, and the steam creates bubbles in the nozzle that often impacts the print. As for me, I did check with a 10+ year old trimmer line with no trouble! Many other oil-based thermoplastics are available to print with, such as the Polyethylene family (high or low density, for bottle caps, food storage containers such as milk jugs, chemical resistant piping, plastic wraps, or PET for synthetic fibers and clear plastic bottles). In fact, a home 3D printer could print any thermoplastic, that melts and can be shaped into a filament. The major limitation is reached when "very" high extrusion temperatures are required, because of the limits of most home-grade hot ends (aka extruders). Getting above 300° is generally considered a serious fire and toxic hazard, because of the released gases both from the plastics and from other components of the printer heated end itself (read about how teflon fumes can kills birds for example). One other plastic worth mentioning is the strong and worthwhile polycarbonate (aka PC or Lexan): don't you have a CD or DVD around? This material is usually seen as crystal clear impact resistant glass, but too low extrusion temperatures seem to degrade a bit these outstanding properties, as described by Richrap (again!). Check also another review at Protoparadigm, which also sells it. This is a very interesting filament that was "discovered" recently. It it a mix of wood particles and polymers, which produces porous objects that resembles cardboard or MDF (aka medium) more than real wood. In my opinion, it is one of the best material ever for artists because of the texture and because it mostly hides the printed layers (with regular plastics you would have to used extremely thin and time consuming layers to get such a finish, or manually post-process the objects). It is reliable as far as I checked (see my dedicated review for the LAYWOO brand, which is the only one available for now -- and is said to have required one year of research). Some people complain that their printer nozzles too often get clobbered by burnt wood though. By varying the temperature, you also achieve different shades of brown, which gives a very artistic finish as shown here. beautiful review at Simon's blog. Actually obviously not real "stone", it is once again a mix of thermoplastic with mineral particles (chalk), for a ceramic-like texture in the end, not to be confused by clay extrusion though (see further). 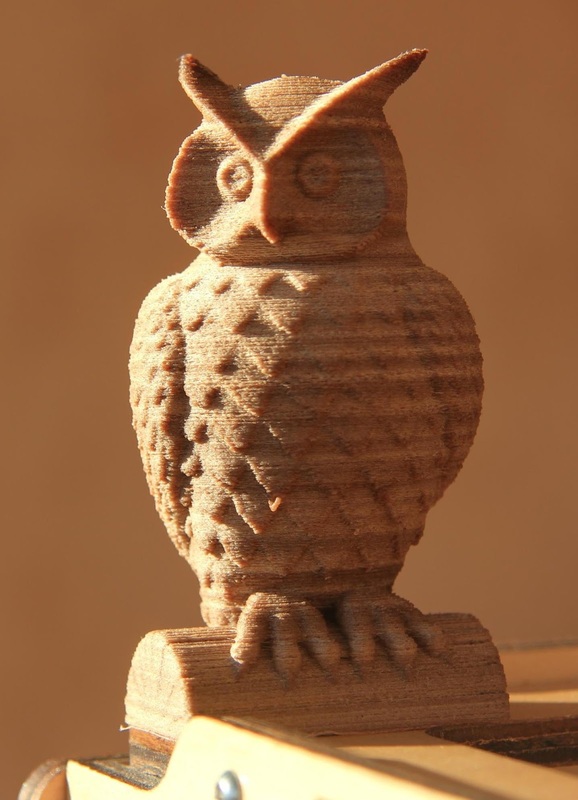 As with wood, this filament is really excellent for artistic goals, not for robotic or industrial applications. The resulting texture is gorgeous. The first one to be on the market seem to be the Laybrick, and was made by Kai Parthy, an outstanding inventor who also created the wood-laden filament above. He also keeps on bringing more on the market, like flexible or porous filaments, among other inventions. For a review of Laybrick and how to print it, I warmly recommend you check Simon's here. These are part of a newer post, centered on the filaments that artists may like better. Here again we talk about a mix. The resulted printed object will certainly not have the same solidity as a carbon-fiber regular made object, but it will be very robust in the horizontal plane. 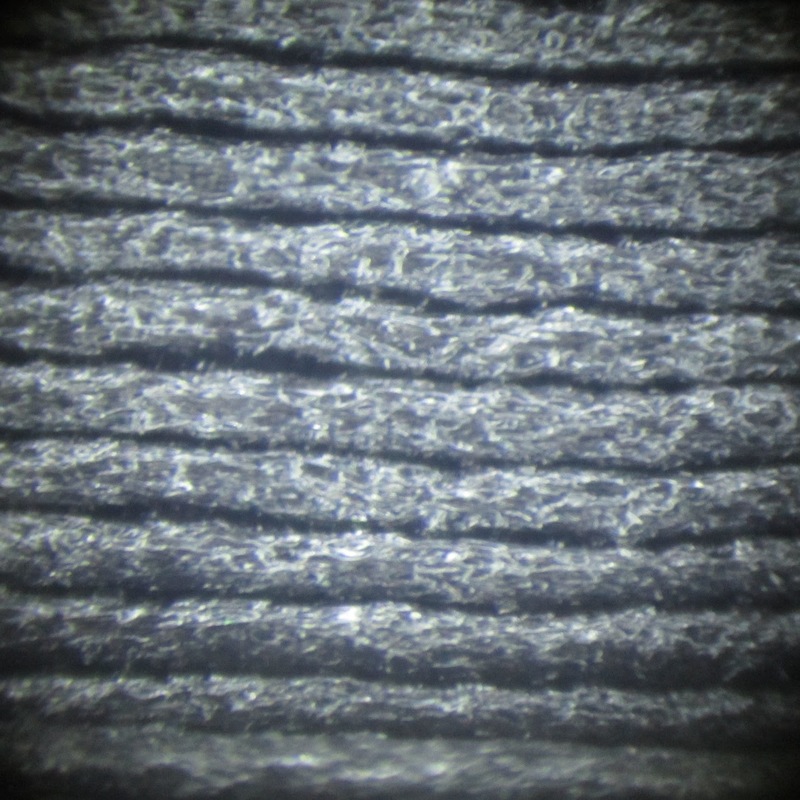 Layers will not bond as solidly though because the fibers will not be mixed in this direction -- until some special 3D deposition process is invented. You can check the so-called CFPLA at proto-pasta, which is based on of the very common NatureWorks 4043D PLA Resin to which they added 15% of Tenax chopped tiny carbon fibers. They also have a set of other interesting material such as Polycarbonate+ABS. Carbon also conducts heat better, which in turn may not enhance its resistance to heat (the bonding agent is still PLA), but it does help cooling the part quickly when it gets printed, which makes CFPLA one of the nicest material I ever printed so far. There are two main kinds of bearings and bushings in machines : those with rolling balls (made out of steel or out of ceramic), and those made entirely out of some very specialized slippery plastic. No real long-term success was made with printed Nylon bushings, mostly because of its greater flexibility and dimensional variability according to moisture. Out of the plastic-based bushings, IGUS is probably the first brand name that pops out, and the great thing is that they just started to produce a so-called "iglidur tribo filament" for use in FDM/FFF printers. I am not affiliated in any way to IGUS, but this material ought to be mentioned here. A few smart students worked on embedding wire in their objects (OK, not printing really). Their spoolhead is worth a look, or for more details check the full PDF report. Printing plastic pellets is a grail for 3D printing at home, because they are much cheaper than pre-made filament pools. 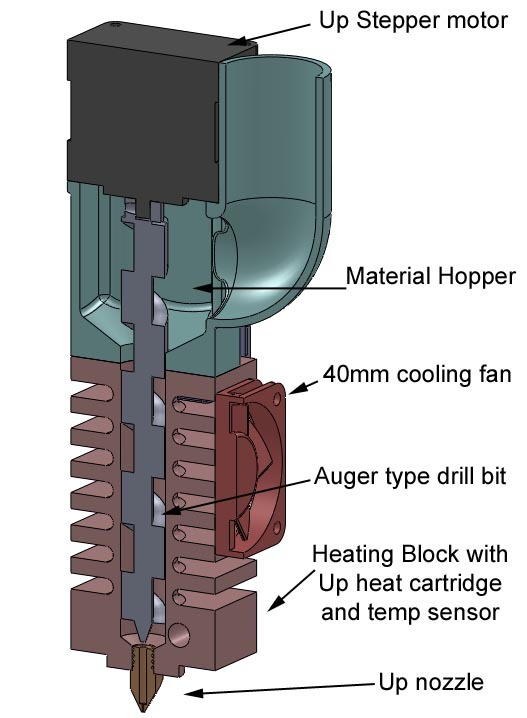 However, nobody found a reliable and homemade way to print pellets directly with a heated auger screw for example (see also next chapter about extruding paste). Instead, one still need a way to reshape the pellets as filament first, and early functional extruders such as the filabot or lyman slowly open the (hobbyist) path. Now, I would definitely love to write more on the matter (ie. to own one of them!). Still a risky investment for now with its own sets of problems probably. But it opens the door to mixing different and unexpected materials, and it is the only way to recycle the pile of broken parts we all keep for this. Make sure to go and check other RichRap worthwhile explorations! Extruding clay (ceramics), icing sugar, chocolate or any other kind of solidifying paste requires a serious modification of the printer head, where the hot end must be swapped with a syringe, a peristaltic pump, an auger screw or some mind-stimulating Moineau pump. Note that clay is abrasive and may damage any pump or screw in the long term, and that chocolate need to be kept warmed when stored in a large syringe. Paste/pellet extruder : an outstanding auger screw design by Olaf Diegel. The revolving drill bit drains molten material downwards through the nozzle. Another interesting material to print is wax, not just to make candles but also to print molds as we will see in the following chapter. 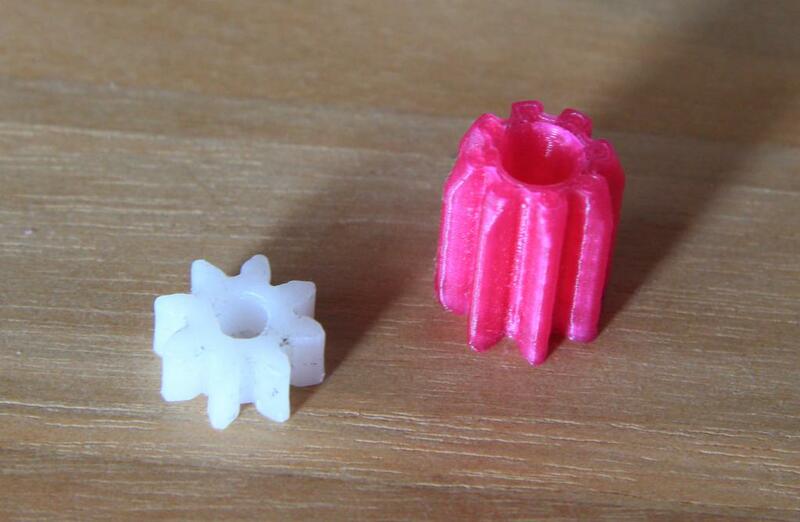 A lot of work is still underway to solve paste extrusion issues, and it looks like every material has its own set of properties and problems, which usually makes it hard and messy to use for now. The final object is not printed directly, but it is cast in a mold which is itself built with a 3D printer. To read more on this topic, check this separate blog. It was getting too long a chapter here a bit off-topic. But a 3D printer really opens the way to homemade semi-industrial silicone or aluminum objects, beyond artistic sculptures. I will add more material and refine this post with time, except for the artistic ones that are described in this specific post. A good read now is all about what cannot be 3D printed! Addendum: where to buy ? There are very important variations in the plastic quality and dimensions which may ruin your day: you should definitely double check your selected supplier in the forums before you buy. To start with something, you may peek in the amazing list of suppliers at Reprap as it includes location, price and a short review (all of which may be obsolete!). Note that even the color pigments impact the process: I once experienced a near-to-impossible dark black filament that probably included too much carbon particles (or was it mixed with some ABS?). It was really hard to extrude correctly and to avoid warping. Note that a finely setup printer does handle large variations in the filament quality. For example, I was quite surprised to see how easy it was to print a 10+ year old, cheap and dirty trimmer line! What really counts in my opinion is the filament diameter as it impacts significantly the volume of extruded plastic, which is probably the most important parameter to set. Now, for sure, Chinese suppliers may be less reliable or trustworthy, but at least I know the quality of the plastic of this brand (ie. very good). Whether short-cutting the system is good or bad is another topic I guess, but my idea is not to trust people that dismiss Chinese material as such, while some of "our" best brands just get it from them in the first place. Thanks for this great article on the different materials which can be 3D printed! Working mainly with PLA on the Rep2 but sure would love to try out something different soon. I will try to keep this post up to date and chase any mistakes or confusion. There are materials I should try for myself, and take more pictures. thanks for the great input. Did you try to print extruded silicone? How was it? Actually I foresee two problems: first it's really messy but more importantly, will it be solid enough to build on top of itself and let you achieve a minimum quality in the end? I am not used to silicone molding either so may be, may be not. There are also chemical additives tha could change the texture and curing rate. Please tell us if ever you try. It may be easier to create a mold and pour silicone in it instead.